Films like Fast Food Nation and Gasland introduced critiques of the food industry and fracking to a broad audience. But as of yet, the active transportation movement has lacked a full-length documentary feature that screens widely in theaters or goes viral on Netflix. Angie Schmitt: So I think the trailer sort of nails it. Can you tell us more about why you’re trying to raise this money? Fredrik Gertten: My last film opened at Sundance and we’ve been playing at all the major festivals, so we have the ability to make a big splash if we do it well. At the same time we, as anybody else in this world, have to fight for survival. It’s complicated when you talk about arts. Both my last films have played in 80 countries and every single state in the U.S. Documentaries now, is a very strong genre and so they really reach out. We are kind of stuck we have like 50 percent finances. We need a Kickstarter to get moving again. AS: What’s going to be the gist of the film? FG: I read a survey about young people, what their biggest worries were, and they were all about climate change. I mean so much that they had pains in their stomach every week. And at the same time the [auto] industry is rolling like nothing ever happened. I mean in Europe and the United States car sales aren’t going up anymore, but in the rest of the world … I’m kind of interested in the mechanisms that make us not change when we know that we should change. The car industry, the oil industry, the construction industry, they’re all lobbying for all this really big-scale urban planning, so they just push for no change. So that’s what I’m interested in: those forces. I’m also looking into the lobby. AS: So the car lobby will be part of your focus? FG: Yes, because they’re very influential in making the changes that are needed. So that’s something I’m looking into but I’m also looking into the bike activists. Because the bike activists are not kind of a traditional political force. A lot of people are just people that started to go on the night ride somewhere and got a passion for bikes and then one day they decided, ‘you know what, if I can do this on a Friday or in evening, maybe I can do this on a Monday to my work.’ And then are out in very dangerous traffic, they also become politicized, because then they have to enter into debate about city planning. We also know that there are more bicyclists killed in traffic than ever before because there are more bikes on the streets now. These people who are not traditional political people, they get political and they are now becoming a very important force in many cities for better city planning. The Brazilian girl in the trailer says, “this is not a war, it’s a city.” The title is, of course, provocative but for me it’s the war between two kinds of city planning, where one kind of machine took away all space. That’s something you see a lot of time in America. It’s a fight for space. In many places there is no space left anymore. If you drive through the big American cities, you can see these big car pool lanes, and there’s no cars in the carpool lane. So there is one person in every car, and together they can consume all the space. Imagine if you 100 years ago said, ‘oh in the future we will all be sitting in big boxes and we’re not going anywhere, we won’t get anywhere because we’re all waiting for each other.’ Somebody, a professor in L.A. said that if you put all the space created for cars and you put it flat out in L.A., it would cover 80 percent of the livable area. Can you imagine selling that idea? People would say it was crazy. I think this is a result of the lobby. They have been lobbying for suburban housing and for suburban shopping and for more cars and more streets and we shouldn’t blame the guy in the car because most of us are sometimes forced to drive by car. We are all victims of a very poor city planning, and of city planning that is kind of lobbied for by mighty forces. We know that we shouldn’t consume that much oil. But we cannot just keep going. The only answer is the people that would lose if we change, they invest so much to keep it going, in publicity and lobby and PR. In the US, 25 percent of all trips are less than 1 miles, 40 percent are less than two miles. People could keep their cars, if they need to go further, longer distances, then have a car, but they could maybe try to go by bicycle to buy the milk or have coffee with their friends instead. In most of the United States, city planning is totally car based. So it’s very hard for people, it’s not an easy change, but it’s not impossible. 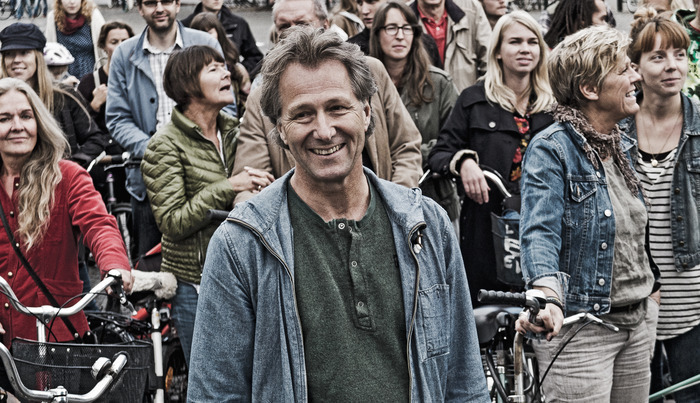 A number I would like to play with in this film … I live in Malmö, which is a really bike friendly city rated like number 7 in the world in bikes. But our neighbor, right near by, Copenhagen 40 percent commutes on bike every day. Take 40 percent and move it to any big American city or all big American cities, and you could say, wow if we had 40 percent less cars, imagine the oil consumption or the climate effect it would have and it’s totally mindblowing. This is an existing utopia, it actually exists and it works. Good job putting Robs Fords. the mayor of Toronto, in that video. He is a quintessential spoiled brat whose imagination has been stunted via the endless use of a motor vehicle. Unfortunately, it looks like the city of Toronto is full of similar idiots and is going to vote him back in so that he can make the city take even more steps backward. I’m stunned that Toronto would elect this buffoon and his pro-car, anti-bike attitudes. I was under the impression that Toronto was a progressive city. I know they had a mayor some years ago who was in favor of less parking and that they removed a freeway there once. Jane Jacobs lived there at one time and helped launch the livable city movement in Toronto. What the hell happened? I have always thought The High Cost Of Free Parking would make a great documentary. NOT CAR. That’s the message that we need to rally behind. A transportation policy that does NOT prioritize CARs. Cars will still be a part of the equation, but something more manageable, at most 40%, but 25% would be better. Toronto has a large metropolitan area which also includes a lot of the formerly independent suburbs. Basically, the suburban voters elected Ford over the desires of those living in the “original” Toronto. Could we please throttle back on the notion that General Motors killed the streetcar (and interurban) in Los Angeles. Yes, National City Lines did perform the last bit of negegence but in fact it was a publicly-operated LAMTA that shut down rail transit in the region. Actually, the biggest enemy to the Pacific Electric and the L.A. Railway (streetcars within the city) was the California PUC and the entity now known as Caltrans. @bobster1985:disqus – That is one of the larger stories of many about this idiot. His idea of governance is pitting sides against each other for simple political gain rather than serving the entire city. It is a shame to see Toronto going down the tubes with him at the helm. Is Equal Justice for Bicyclists on the Horizon?